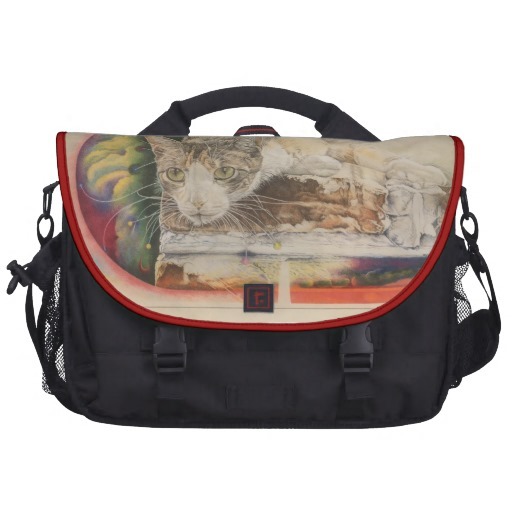 Rickshaw Calico Cat Laptop Bag. Water resistant, extra durable construction. Holds up to 15" laptop (sleeve included). 2 large front pockets and rear organizational pocket. Magnetic silencers, Velcro, & clip flap fasteners.. Wallpaper and background images in the Handbags club tagged: calico cat rickshaw bags laptop bag style bags handbag. This Handbags photo might contain valise, mala, weekender, fim de semana, mochila, mochileiro, and packsack.